Are you flying solo, need a girls night out, or a speacial date night for you and your sweetheart? 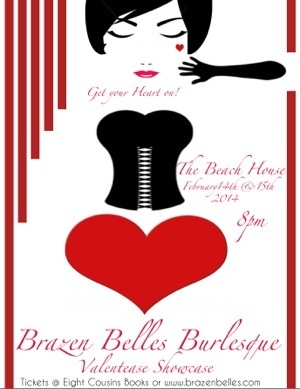 Get your heart on with the Brazen Belles for a Valentease extravaganza Febuary 14th & 15th . All tickets include a pre cocktail party from 6-7:30 with complimentary hors d’oeuvres. Or if you’re feeling extra fancy reserve one of our champagne tables. Package includes VIP seating for up to four people, a premium bottle of champagne, fruit and cheese plate, and some extra special gifts from the Belles!